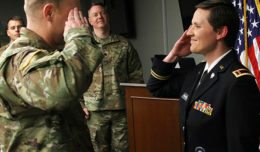 Senior Master Sgt. 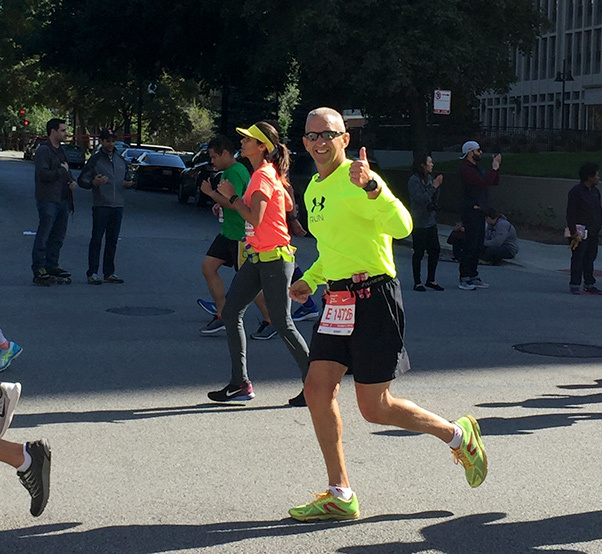 Todd Kirkwood, the 167th Maintenance Group superintendent, gives a thumbs up at mile 25 of the Chicago Marathon, Oct. 9, 2016. Kirkwood ran the marathon only eight months after undergoing chemotherapy and radiation treatments for cancer. His cancer diagnosis came as a complete surprise. After all, he had just run his 21st marathon. Other than a recent cold, he was a picture of perfect health. Chief Master Sgt. Todd Kirkwood, the 167th Maintenance Group superintendent, received the news of his diagnosis the day after Thanksgiving in 2015. Less than a year later, after a very aggressive treatment, he is cancer free and just completed his 22nd marathon. “I feel it’s by God’s grace and mercy, along with the prayers of many, that carried me through this journey this past year to my restored health today,” Kirkwood said. Kirkwood was just a few weeks away from running the Marine Corps Marathon in Washington, D.C., last October when he caught a cold. He went to see his family doctor in Greencastle, Pennsylvania, hoping to get something to relieve his symptoms. The doctor noticed that he had a swollen lymph node in his neck. Kirkwood wasn’t concerned. He said it had been swollen prior to having an impacted wisdom tooth removed two years ago. His oral surgeon told him that it was not uncommon to have swelling or damage to a lymph node after surgery. With a logical explanation for his swollen lymph node, his family doctor prescribed him an antibiotic for his cold and sent him on his way. As his marathon date drew closer, his cold symptoms lingered. Kirkwood called his doctor again hoping to get something stronger to knock the cold out of his system. His doctor referred him to an ear, nose and throat specialist for the cold symptoms and also for his swollen lymph node. The specialist could not see him until the week following the marathon. So, Kirkwood ran the marathon sick, and afterward, his ear, nose and throat specialist ordered a CT scan in early November. Upon viewing the results, he promptly scheduled a surgery to have the lymph node removed. The day before Thanksgiving, Kirkwood underwent a 1 hour, 40 minute surgery. It had been scheduled for 20 minutes. The cells had spread out of his lymph node and were growing around his jugular vein and moving toward his ear. Two days and one 5K race later, Kirkwood returned to the ear, nose and throat specialist for a follow-up. That’s when he first heard the word that had never crossed his mind — cancer. He quickly realized the possible outcomes. “It was a lot to process,” he said. A biopsy identified it as squamous cell carcinoma, a cancer that originates in the tongue and tonsil region. “The lymph node wasn’t the source, but it caught the (cancer) cell,” Kirkwood explained. His doctors ordered a positron emission tomography scan hoping to locate the source cell. They couldn’t detect the cell on the scan. They determined they were dealing with a microscopic cell. A vigorous treatment plan was established. His team of doctors, affiliated with the National Cancer Institute of Philadelphia, prescribed 35 radiation sessions and three chemotherapy treatments to be completed in seven weeks. Every weekday for seven weeks, Kirkwood was driven to Gettysburg, Pennsylvania, to receive treatments. Kirkwood was quick to express gratitude for the tremendous support network he had during that time. “Every day I had a different driver to take me to my appointments, some being unit members that came up,” he said, noting the distance they had to drive. 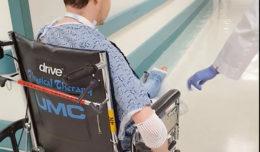 He lives about 30 minutes from the West Virginia Air National Guard base and his treatments were another hour drive from there. During his treatments, Kirkwood wore a custom-fit, mesh-like mask over his head and neck while he received radiation in a linear accelerator. The mask helped to pinpoint locations where the radiation was needed, minimizing the impact to his healthy cells. By the fifth week of his treatment, he could no longer eat food orally. He used a feeding tube to ingest liquid nutrition but struggled to consume 200 calories a day. He’d lost 40 pounds by the end of his treatments in mid-February. Still, he had to wait three months, as the radiation subsided, to learn that his treatments were successful. In the meantime he concentrated on recovery. On May 8, he was feeling well and the weather was nice, so, he decided it was a good day to lace up his running shoes for the first time since his diagnosis five months earlier. Five miles later, he had completed his first training run for the Virginia Beach half marathon. “I had signed up for the 2016 Virginia Beach half marathon last year while I was at the expo for the 2015 Virginia Beach half marathon, so life as I knew it was still normal,” Kirkwood said. The Virginia Beach half marathon scheduled for Sept. 4, 2016, became his initial goal of returning to a starting line. Kirkwood crossed that finish line in 1 hour, 54 minutes. 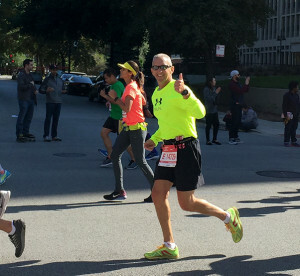 About a month prior to completing that race, a family friend entered him into a drawing to win a race bib for the Chicago Marathon, one of the largest marathons in the world. He won the entry into the race scheduled for Oct. 9, giving him about eight weeks to train. Kirkwood explained that he built up his weekly mileage to about 40 miles a week and to do it safely he often ran two shorter runs a day rather than one long run. When he stepped into the starting corral in Chicago, with more than 40,000 fellow runners, Kirkwood said he wasn’t thinking about cancer. There is a journey to the starting line of every marathon. When Kirkwood stepped to the starting line he was determined to validate the restoration of his physical health. His first goal was to simply finish the race. His secondary goal was to complete it in less than 4 hours, 30 minutes. During the 26.2 mile race, about half way through the course, he began chatting with one of the pacers named Betty. She asked him to share a little bit about himself with her. He told her about his journey to the start line that day. Kirkwood finished the marathon in 4 hours, 9 minutes. Restoration of physical health — validated. Kirkwood said prior to his diagnosis he, like so many others, got caught up with the stress and business of everyday life.